STOP CETA & Co.! AGRICULTURE IS NOT FOR SALE! 25th of January 11:30 a.m.
Trans-European resistance against the CETA trade deal converges once again and takes the stage this 25 January. Farming organisation ECVC with its members AbL (Arbeitsgemeinschaft bäuerliche Landwirtschaft – Germany), the FUGEA – Belgium, along with the European Milk Board (EMB), the MIG-Belgium (Milcherzeuger Interessengemeinschaft), and other organizations, are making a stand in the Belgian-German border to say NO to CETA and other free trade agreements (FTAs) contrived by European authorities on the backs of farmers and consumers. Agricultural dumping, the privatisation of public services, sapping health and environmental regulation, are just a few of the toxic elements melded to the CETA, however, public pressure has managed to isolate one that, has a result, is being examined by the European Court of Justice (ECJ) : the ICS (investment court system, former ISDS). The ICS allows big business to circumvent the public court system and creates a special jurisdiction accessible only to them, where private judges, paid by the companies, scrutinize the cases. If a corporation considers that the recent implementation of a government’s public policy -like stricter environmental regulation or stricter labour laws- puts its profits at risk, then it can take the State to the ICS. This hijack our already fragile democracy and doesn’t benefit European nor Canadian peoples. Only corporate interests! On the 29 January the ECJ will render its decision on the compatibility of the ICS with EU law. Against this backdrop, we, the European peasant movement, want to, once again, send a strong signal to European governments that the CETA and the other FTAs negotiated by the EU are bad for agriculture, food security, the environment, healthcare, labour and democracy. 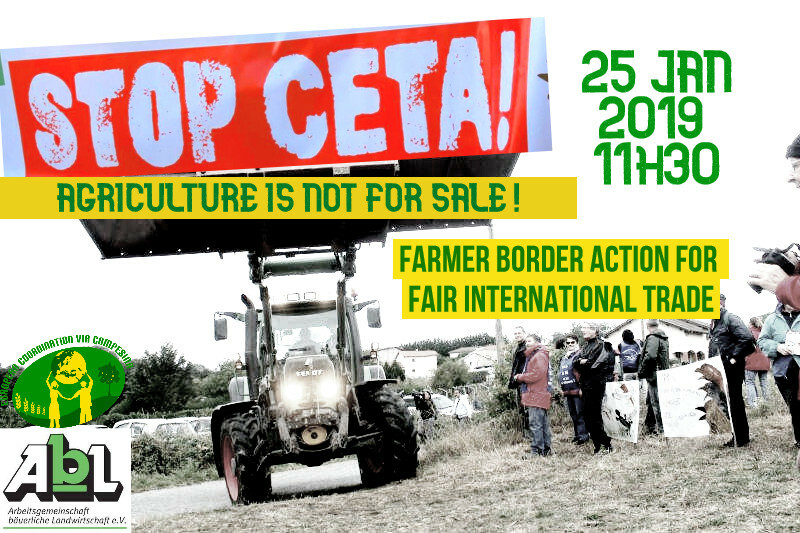 Livestock farmers, peasants, citizens, let us unite this 25/01 against the CETA and other toxic free trade deals!! The action takes place on the highway bridge over the border motorway A3/E40 near Lichtenbusch (Access by E40, Exit 40) on Friday 25 January 2019 at 11:30 a.m. Program: Tractors, banners, and people will rally on the bridge, where speeches will be given, the symbolic signing of the farmers’ declaration, pictures taken, and space given to interact with the media. The tractors must not have a front loader with fork/bucket, trailers etc., must be empty to be allowed to drive on the bridge.